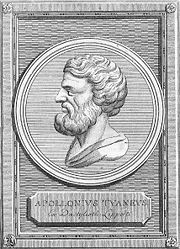 Apollonius of Tyana (Greek: Ἀπολλώνιος ὁ Τυανεύς; ca. 1 – 97 C.E.) was a Greek neo-Pythagorean philosopher, ascetic teacher, and wonderworker. His teachings and legend influenced both scientific thought and occultism for centuries after his death. Born at Tyana in Asia Minor, Apollonius was educated at Tarsus and at the Temple of Aesculapius at Aegae, where at 16 he devoted himself to the doctrine of Pythagoras, whose teachings he followed all his life. In his quest for further knowledge, he traveled to Eastern countries and, according to legend, performed miracles wherever he went. He is known mainly through a long account by the sophist writer Philostratus of Athens, whose biography of him is built upon a series of dialogs and stories of the sage's often miraculous activities during his wanderings. A number of letters supposedly by Apollonius are now thought to be forgeries, but play an important role in how he was perceived throughout history. 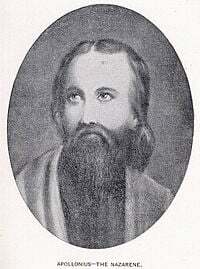 An ascetic vegetarian and mystic who acquired a reputation for his magical powers, Apollonius was a contemporary of Christ, and the miracles attributed to him were often compared to those of the preacher from Nazareth. During the Enlightenment and more recently, he became the subject of a good deal of admiration as a spiritual teacher. The eighteenth century English occult writer Francis Barrett claimed Apollonius to be "one of the most extraordinary persons that ever appeared in the world." Apollonius was born in the city of Tyana, in the Roman province of Cappadocia in Asia Minor. He was educated in the nearby city of Tarsus, where he devoted himself to the doctrines of Pythagoras and adopted the ascetic habit of life in its fullest sense. He first became a religious teacher while still young in the temple of Asclepius at Aegae in Cilicia. He then traveled in the neighboring province of Pamphylia. Having reportedly kept a vow of silence for five years, Apollonius decided to travel to India to learn the wisdom of the Persian magi and the Indian Brahmins. He also went to Egypt to study the ways of the Gymnoi ("Naked Ones") there. On his way through Asia and before reaching the Euphrates, he visited a sacred Syrian city of Hierapolis, where he attracted a disciple, Damis, who kept a diary of Apollonius's deeds and sayings. These notes reportedly described a number of incidents and adventures, including events relating to Roman emperors from Nero (54-68 C.E.) to Nerva (96-98). Eventually Damis' notes are said to have come into the possession of the Empress Julia Domna, wife of the emperor Septimius Severus (194-211), who commissioned Philostratus of Athens to use them to assemble a biography of the sage. The narrative of Apollonius's travels, as reported by Philostratus, is replete with miracles and legends. In the words of historian Edward Gibbon, "we are at a loss to discover whether he was a sage, an impostor, or a fanatic." Apollonius reportedly continued to travel widely after his return from Europe, going far up the river Nile as far as Ethiopia, and in Spain as far as Gades (modern Cádiz). Though he had many followers and admirers, Philostratus admits that he also made many enemies, notably the Stoic philosopher Euphrates of Tyre. Both Apollonius's friendships and his quarrels are also reflected in his supposed extant letters. In these he claimed only the power of foreseeing the future. Philostratus, on the other hand, relates a number of miracles performed by Apollonius. For example, he either raised from death or revived from a death-like state the daughter of a Roman senator and miraculously escaped death himself after being accused of treason both by Nero and by Domitian. After further travels in Greece, Apollonius finally settled in Ephesus. Philostratus keeps up the mystery of his hero's life by saying, "Concerning the manner of his death, if he did die, the accounts are various." Philostratus seems to prefer a version in which Apollonius disappears mysteriously in the temple of the goddess Dictynna in Crete. Philostratus' voluminous Life of Apollonius explains that the sage of Tyana was a teacher of asceticism whose personal knowledge featured not only an understanding of mathematics and philosophy but also direct revelations from the gods. Philostratus himself was an Athenian sophist and professional orator. While emphasizing that Apollonius was indeed a worker of wonders, Philostratus refutes the notion that the sage of Tyana was a magician. The miracles that Apollonius performed were thus the result of his superior knowledge, not of wizardry or the ability to perform magic tricks. Apollonius was believed to have taught a belief in God as the supreme being, whom he conceived of as being fundamentally apart from the Universe, and is completely perfect, needing nothing from human beings in terms of sacrifices or offerings. In terms of the human relationship, prayers are unnecessary, but contemplation, both mystical and rational is encouraged. In no other manner, I believe, can one exhibit a fitting respect for the Divine being... than by refusing to offer to God—whom we termed First, who is One and separate from all, as subordinate to Whom we must recognize all the rest—any victim at all. To Him we must not kindle fire or make promise unto Him of any sensible object whatsoever. For He needs nothing, even from beings higher than ourselves... We should make use in relation to Him solely the higher speech, I mean that which issues not by the lips; and from the noblest faculty we possess, and that faculty is intelligence, which needs no organ. On these principles then, we ought not on any account to sacrifice to the mighty and supreme God. Apollonius was said to have warned the citizens of Ephesus of an impending plague, but they ignored his warning until the pestilence struck. Remembering his prophecy, they sought further advice of the man they thought to be a mighty magician, who revealed that there was a wretched beggar among them who should be stoned to death. After the deed was done, the people removed the pile of stones under which they thought the beggar laid, however they only found a black dog, which Apollonius explained was the actual cause of the plague. The situation in which Apollonius was reported to have brought the daughter of a Roman consul back to life also won him widespread fame. However, Philostatus was unsure whether the girl just appeared to be dead or was actually dead. Apollonius is also said to have stopped one of his former students, Menippus of Corinth, from marrying a vampire. Apollonius appeared as a guest at the wedding festivities before the banquet. He then made all the banquet's amenities and even some of the guests disappear, proving that they must have been an illusion created by the evil bride. He then made the young woman to confess her true identity, thereby rescuing Menippus from a terrible fate on his wedding night. Another recounting has an Indian magician making seven rings representing the seven planets and giving them to Apollonius, who wore a different one each day. The legend has it that this enabled him to maintain his youthfulness well into old age, with his living reportedly to 100 years of age. There is also a mystery surrounding Apollonius' death. Some reported that he fell out of favor with Emperor Severus, who put him on trial and had his hair cut off to eradicate his magical powers. Then Apollonius simply vanished from the courtroom, never to be seen again. Although his followers said that he had died, they nonetheless insisted he was taken up into heaven. Meanwhile, Philostratus related several other versions of Apollonius' death, including that the sage of Tyana vanished in the temple of the goddess Dictynna. 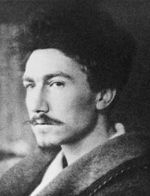 Ezra Pound evoked Apollonius in several of his later Cantos. Apollonius has continued to exert significant influence throughout the centuries. Coins were struck and statues erected commemorating him, and in Tyana, a temple was built and dedicated to him. Around 300, a certain Hierocles endeavored to prove that pagans were more reasonable in believing the sayings and doings of Apollonius than Christians were in believing the "ignorant" followers of Jesus. The Christian bishop, Eusebius of Caesarea wrote a Reply to Hierocles, in which he argued that Philostratus' account of Apollonius was much more incredible than anything that Christian sources said about Jesus, and if what Philostratus said was true, then Apollonius must have been in league with demons. This started a debate on the relative merits of Jesus and Apollonius that has gone on in different forms into modern times. In Late Antiquity, Apollonius became a hero of pagan culture, though Christian writers were sometimes sympathetic towards him because of his lifelong chastity, avoidance of alcohol, and devotion to a religion that rejected sacrifices to the Roman gods. The late fourth-century Historia Augusta says that Apollonius appeared to the Emperor Aurelian when he was besieging Tyana, Apollonius' hometown. Aurelian supposedly claimed to have seen Apollonius speak to him, beseeching him to spare the city of his birth. "Aurelian, if you desire to rule, abstain from the blood of the innocent!" Apollonius declared. "If you will conquer, be merciful!" Aurelian, who admired Apollonius, therefore spared Tyana. Apollonius continued to be influential in the Middle Ages. For example, the medieval Islamic alchemist Jabir ibn Hayyan's Book of Stones contains a lengthy analysis of alchemical works attributed to Apollonius. In Europe, several advocates of Enlightenment saw him as an early proponent of a universal, non-denominational religion compatible with Reason. In 1680, Charles Blount, a radical English deist, published the first English translation of the first two books of Philostratus' Life of Apollonius. Voltaire, too, praised Apollonius. In the Marquis de Sade's "Dialogue Between a Priest and a Dying Man," the Dying Man compares Jesus to Apollonius as a false prophet. Some teachers of Theosophy, notably C.W. Leadbeater, Alice A. Bailey, and Benjamin Creme, considered Apollonius as an Ascended Master and/or an embodiment of the Master Jesus. Helena Blavatsky wrote that Apollonius, though "perhaps less metaphysical and more practical than Jesus," taught the same "high moral truths" that Christ did. In the twentieth century, Ezra Pound evoked Apollonius in his later Cantos as a figure associated with sun-worship and a messianic rival to Christ. Pound also celebrates Apollonius' aversion to ancient Jewish animal sacrifice. More recently Apollonius appeared as a fictional character in the 1935 novel The Circus of Dr. Lao, as well as the 1964 film adaptation 7 Faces of Dr. Lao. All links retrieved April 8, 2016. History of "Apollonius of Tyana"
This page was last modified on 8 April 2016, at 18:53.